Random Views: Left and right: opposite wings or the meeting point of a circle? Left and right: opposite wings or the meeting point of a circle? That was French Socialist Party politician Jean-Luc Mélenchon in 2002, the first time the far right National Front saw its candidate, Jean-Marie le Pen, win a place in a run-off election for President. In 2017, no longer in the Socialist Party, Mélechon took a stance on the far left of French politics and came fourth in the first round of the Presidential election, with a respectable but insufficient 19.5% of the votes cast. Once again, the far right is through to the runoff – in this case represented by le Pen’s daughter, Marine. But, amazing to relate, Mr Mélenchon seems to have forgotten his wise words of 2002 about the damage of delay, preferring indeed to delay day after day instead of coming out in favour of the centrist candidate, Emmanuel Macron, front-runner in the first round and now the only candidate able to block “a further advance by the far right”. Now, why might that be? Could it perhaps have something to do with the sense that rather a lot of Mélenchon’s voters might prefer to go with the hard right in the second round, than with the soft left? And that Mélenchon would rather go along with that than lose contact with a voter base he rather values? Call me cynical if you like, but that’s what I think is going on. There is in the hard left a holier-than-thou attitude which claims that it’s more principled and honest than the rest of us, but it’s capable of being just as opportunistic and evasive as, say, a Blair or a Putin. At a deeper level, there is also a deeper link between far left and far right. Both are far out. They like to reason in terms of simple, pure solutions to complex problems, which avoid any of the complexities and messiness of reality. Compromise? That only dilutes the purity of our principles. Instead you end up defending a maximalist policy which, on the left, can lead you to defend the rights of the poor so hard in Venezuela that you bankrupt the country and starve your people. On the right, it leads to taking Britain out of the EU to escape from international control, only to leave it entirely dependent on the whims of the United States (or, worse still, the Trumpiverse). There is today a taste for the simple and uncompromising. And it leads to the far right and far left both exerting greater appeal than they usually do – and almost interchangeably. Which is why voters can switch from Mélenchon to the National Front without apparent inconsistency. Nor is this an exclusively French phenomenon. 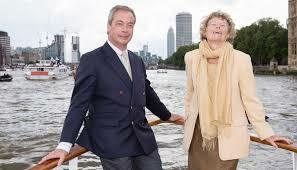 Kate Hoey, left-wing Labour MP for Vauxhall, has an enviable reputation for standing up for the rights of her hard-pressed, poor constituents. And yet, seduced by her enthusiastic dislike of the European Union, she found herself working shoulder to shoulder with Nigel Farage, then leader of UKIP, the British equivalent of the French National Front. They may have come to their common position from opposite directions but ended up, like two halves of a circle, meeting at a single point. In the pursuit of fantasist, simple solutions, people can find themselves with strange bedfellows, though they approach them from different directions. Britain, sadly, is going to be living with the consequences of those fantasies for decades to come, struggling to find a role outside the EU. In France, on the other hand, if the defeat of Mélenchon is followed and confirmed by the defeat of the National Front, that fate may well be dodged.